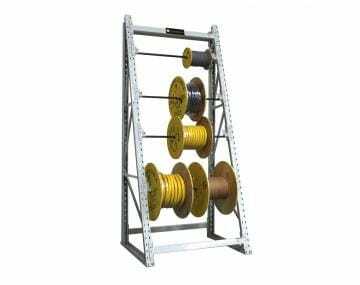 The large cord and cable reel rack has a 10,000 lbs. capacity. Each level of the rack is adjustable and can support 60-inch diameter reels and 2,000 pounds. The large reel rack is heavy-duty, easy to assemble, and keeps areas organized. The large reel racks can be bolted together to expand capacity. HIGH CAPACITY REEL RACK — Adjustable for up to 60" diameter reels. Brackets support up to 2,000 lbs per level, Max capacity 10,000 lbs. SAFETY PINS LOCK AXLE BRACKETS AND CROSS BEAMS TO UPRIGHT FRAMES — Cross beams and brackets adjust on 3" centers. HEAVY-DUTY 12 GAUGE STEEL UPRIGHT FRAME — Measures 3-1/2" wide x 3" deep. 10 gauge steel axle brackets. Lapped and welded beams have three hooks for positive connection. REEL RACK INCLUDES — 2 upright frames with built-in brace set, 2 pairs of cross beams, 4 pairs of axle brackets. Rack should be secured to the floor.